LARAMIE, Wyo. – At an altitude of 7,220 feet, opposing teams have been known to find themselves gasping for air when playing here at the Arena-Auditorium. But Wednesday night it was the host Wyoming Cowboys who were the ones taking one big deep breathe at the final buzzer. The Cowboys were clinging to a 66-65 lead when UNLV point guard Jovan Mooring, who sank seven 3-pointers in last Saturday’s double overtime victory over Air Force, pulled up for a potential game-winning trey. But Mooring, who earlier had connected on a 35-footer, missed from the right side of the key and Wyoming (14-7, 4-4) held on for the Mountain West Conference victory. UNLV (10-11, 3-5), which had trailed by as many as 20 points late in the first half, had rallied to take a 64-61 lead with 1:45 to go on a Christian Jones rebound basket of a Mooring miss. But Wyoming tied it 13 seconds later on a three-point play by guard Justin James, then took a 66-64 lead with 59 seconds to go on a James jumper. The Rebels then had a chance to tie it but Mooring made just one of two free throws to cut the deficit to 66-65 with 40 seconds left. 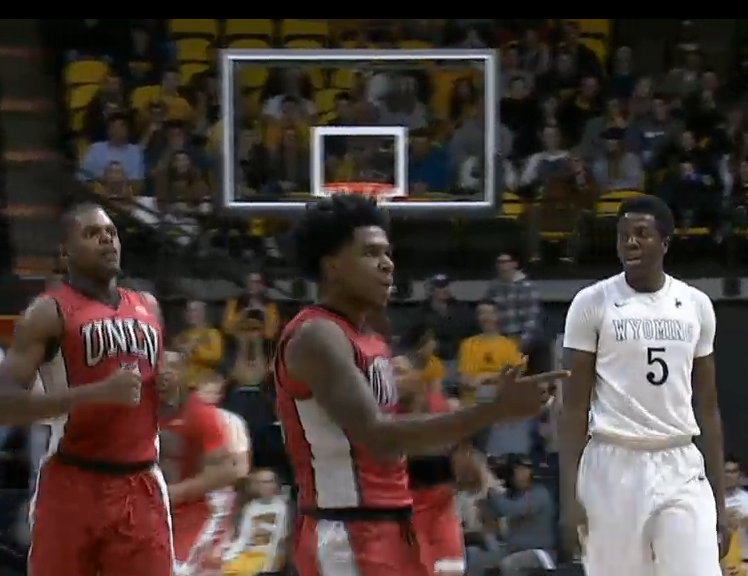 After James missed a short runner, UNLV got the rebound and called timeout with 6.1 seconds remaining. Mooring then got the ball on the inbounds play and dribbled down court before pulling up and missing the 3-pointer at the buzzer. Mooring finished with a team-high 15 points but was just 4-of-13 from the field, including 1-of-5 from 3-point range. Freshman Zion Morgan keyed UNLV’s big second half comeback and finished with 12 points and six rebounds while Jones had 14 points and 12 rebounds. Forward Hayden Dalton had 15 points and 10 rebounds, guard Louis Adams scored 15 points, including 3-of-3 3-pointers, and James added 14 for Wyoming, which won for just the third time in seven games and avenged an earlier 81-75 loss to the Runnin’ Rebels at the Thomas & Mack Center. UNLV lost despite finishing with a huge 47-33 rebounding edge. The Runnin’ Rebels, who shot just 38.1 percent from the floor and were a dismal 12-of-21 at the free throw line, grabbed 17 offensive boards but were only able to convert them into eight second chance points. UNLV returns to action on Saturday when it visits San Jose State (9-10, 2-6) in a 2 p.m. start.